The Finalists for the 55th R&D 100 Awards were announced in August. The finalists include a number of the premier research laboratories and known inventive companies from around the globe, along with a number of smaller up-and-coming companies. National Lab finalists from the USA include: Sandia, Lawrence Livermore, Oak Ridge, MIT Lincoln Labs, NASA Langley, NASA Glenn, Brookhaven, Idaho National, Pacific Northwest, Argonne, and Los Alamos. Taiwan’s ITRI (Industrial Technology Research Institute), a perennial winner, has multiple finalist products. If you are not aware of ITRI, give them a look. Inventive Company finalists include: Siemens, Hitachi, Boston Scientific, Dow Chemical, Dow Corning, PPG, IBM, Tektronix, Tupperware, Illumina, Battelle, Rust-Oleum, GM, General Cable, Southwire, PerkinElmer, and Ametek. It is not really fair for me to cherry pick from the finalist list, but American Standard jumped out. They have a finalist product we can all understand, the “ActiClean Self-Cleaning Toilet.” Buckle-up for that. Coulson, a Canadian company, has also submitted its new “Coulson Ice Blaster” product which is likely to secure a place in the industrial cleaning market. It cleans with ice and you just wipe away the water. As well, there are a host of 3D/rapid prototyping, MEMS, and Micro finalist products. And, there is a “smart footwear” product for modern cities from a collaborative effort between the National Universities of Taiwan and Taipei. All in all, it is a mind boggling range of inventions and innovations competing for the 55th R&D 100 Awards. Three years ago, R&D Magazine switched their approach. Finalists used to be announced in advance of the awards event. Now, there is a great deal of suspense as companies don’t know if they won until their name is called at the Awards Dinner. This year, that will be Friday evening November 17. The winners will be published by R&D Magazine shortly after the Awards Dinner concludes. Also three years ago, R&D Magazine decided that it made sense to produce a conference associated with the Awards Dinner and I became involved. Last year, my two presentations were rated one and two and resulted in the honor of being asked to help develop the program for the third year. The 3rd Annual R&D 100 Conference will be held Thursday/Friday November 16/17, in advance of the Awards Dinner on Friday evening. After being at Caesar’s Palace the first year, and then the Gaylord National Convention Center in DC last year, this year’s conference and awards dinner will be at Walt Disney’s Swan Resort in Orlando. The agenda is packed. There are 28 speakers The two keynotes are Jeff James of the Disney Institute and Scott Kirsner of Innovation Leader. Scott will open-up the conference Thursday morning with a talk on “Perils, Pressures and Productivity: How R&D Needs to Reposition Itself.” R&D Magazine will also be repeating its “Technology Transfer Forum” panel which has been a big draw the first two years. 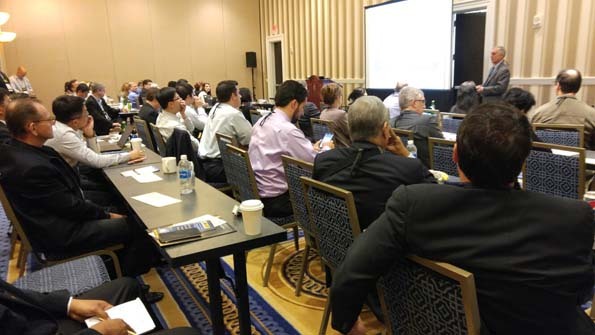 My presentation this year will be on “Optimizing R&D Performance Through Metrics.” Award finalists and conference-only participants are quite attentive to the sessions. Some of the most capable innovators in the world travel long distances for this event, and they seriously engage. Above is a look from last year at a packed room for my presentation on “10 Breakthrough Innovation Techniques.” The rooms are packed for just about every topic and the Q&A is fairly intense. 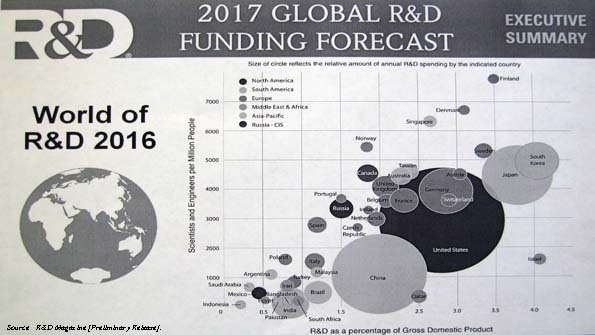 One of the highlights of the conference, which was simply a published report in the years before the conference began, is Tim Studt’s “Global R&D Funding Forecast.” Tim was the Managing Editor of R&D Magazine for some thirty years until two years ago. Now, in his not so retired retirement, Tim continues to produce this annual gem. There is not a better source for “what is being spent where” on R&D. A long-time colleague, GGI has used Tim’s reports in our executive education classes for years. It is wonderful to be able to hear Tim present the Global R&D Funding Forecast and to be able to ask questions. This presentation alone is worth the entire value of the conference. The rise of China, the emergence of the Scandinavian countries as global innovation leaders, and the decline of former innovation leaders could all be foreseen by relatively straightforward comparative analysis of these Funding Forecasts. If your schedule can accommodate it, the 3rd Annual R&D 100 Conference would be a good use of time on November 16-17 for anyone involved in innovation and invention. If you have never been to an R&D 100 Awards Dinner, everyone should attend one these eye-popping ceremonies during their career. There is nothing like it. and announcements of GGI public events. This entry was posted on Tuesday, October 31st, 2017 at 8:05 pm	and is filed under Blogroll, Innovation, Organization, Research, Strategy, Tactics. You can follow any responses to this entry through the RSS 2.0 feed. You can leave a response, or trackback from your own site.